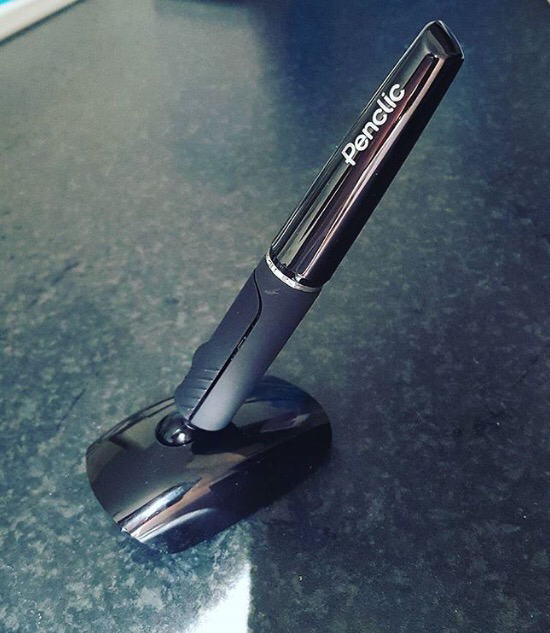 This mouse is a really smart looking device as you would guess from the name it is in the style of a pen and I would reckon has helped a lot of people who suffer with repetitive strain injury from the regular mouse usually used. The mouse comes with an instruction book which does show the relief your hand gets from using the penclic brilliant for people who work with computers on a daily basis (my mother included). The battery does take a while to charge like most new things I had to charge this battery over night as I thought it could be charged through my computer while using it but sadly not. The mouse does come with it’s own rechargeable battery and states not to use disposable batteries so I guess the lengthy charge up time is to save on buying new batteries all the time and I presume the battery length is a good one for an overnight charge. My mother who does suffer with repetitive strain injury and has used all sorts of different gadgets to ease the stress on her wrist while at work loved this little pen, the pen is mounted on a ball which acts as the movement for the penclic with a fixed base. The movement is just like a normal pen with the scroller directly on the pen along with the right and left click so easy for your fingers to navigate in a really comfortable position unlike the usual mouse where your wrist is set at an awkward position. The sensitivity can be set to just how you like it I have a feeling those who use photoshop would love this as it makes slight movements so effortless and precise. Setting up the mouse might be tricky as it took a while for my laptop to install it, whether this is a glitch on my laptop or the mouse I’m not sure but for someone who isn’t very tech savvy this might cause a bit of frustration and then take away from how cool this little guy is! Once you get used to the movement which took me a few days I have to admit I think this can really help make using computers enjoyable again if they suffer with RSI and for those who use paint or photo editing programs I think they will really enjoy getting to know the penclic. It is light, I love the fact it is wireless and works on so many surfaces (I’ve used it on glass, wood and marble). Overall I really like this mouse and I am so glad I have been introduced to it and the same goes for my mother who will be buying one for herself!